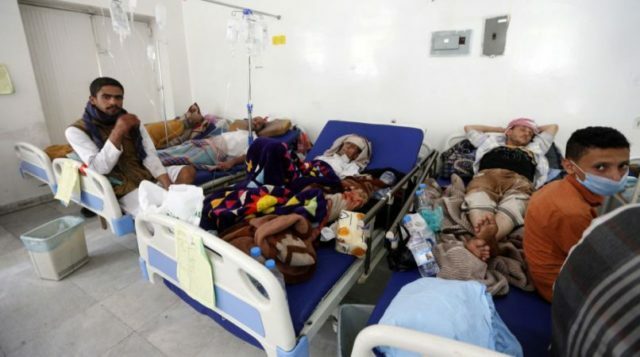 In an update on the cholera outbreak in Yemen, as of June 17, 158,960 suspected cholera cases and 1,100 deaths have been reported in 20 of the 23 governorates and 83 percent of the districts. The four most affected governorates are Amanat Al Asimah (Sana'a city), Al Hudaydah, Amran and Hajjah with 49.6 percent of the cases reported since Apr. 27. Save the Children, at least one child is infected every minute. An average of 105 children are contracting cholera/acute watery diarrhea (AWD) every hour - or one every 35 seconds. More than 30 people a day are already dying, many of them children and thousands could perish with up to 300,000 cases predicted in the coming months. Yemen's crippled infrastructure, food insecurity, failing economy and the ongoing war, mean many are unable to seek out help in time, with hospitals overwhelmed and short of supplies. The situation is particularly bad in more remote parts of the country with little or no access to health services. War, near-famine conditions and a complete breakdown in basic social services, including affordable transportation and access to clean water, are making the outbreak worse.